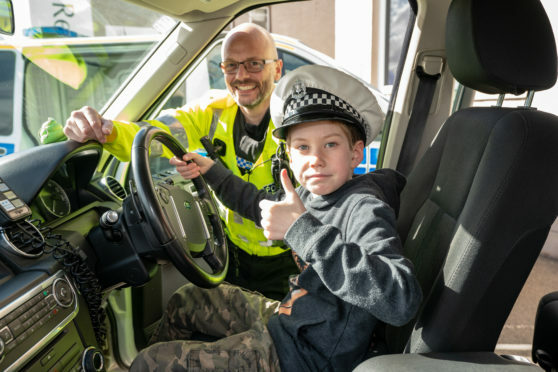 Ben Richards, 10, inside a police car at the Moray Blue Lights Festival. A fleet of police cars, fire engines, ambulances and coastguard vehicles were on display at Elgin’s inaugural Blue Light Festival at the weekend. Sirens from the cavalcade rang round the car park at Moray College UHI as crews eagerly demonstrated the range of piercing noises the vehicles make. They also allowed youngsters to experience the feeling of what it is like to be locked in the back of a police van. 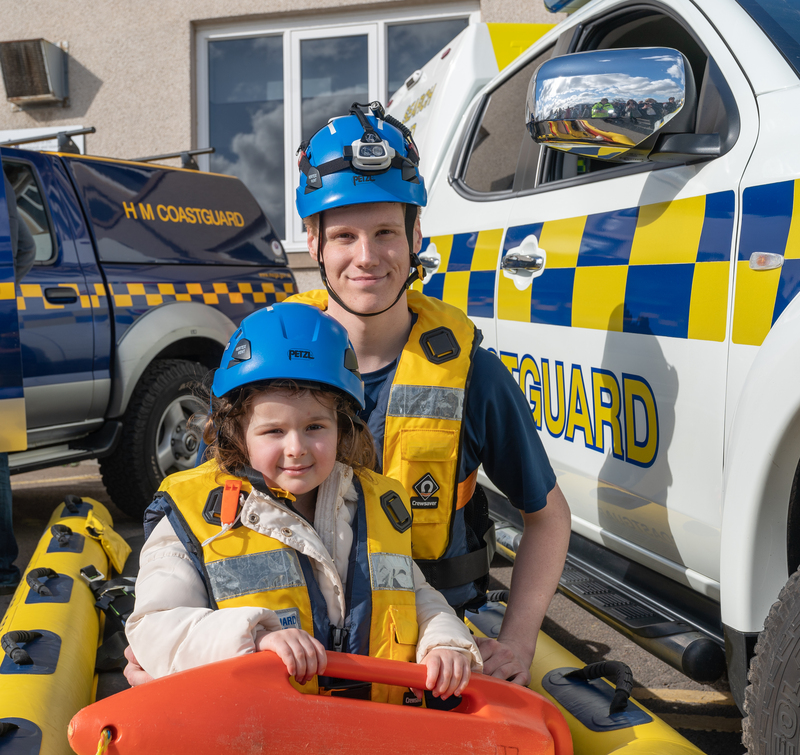 Olivia -Rose Dutay with her Coastguard Uncle Mathew in the Rescue Boat. Meanwhile, officers also demonstrated the range of equipment they use when called to emergency incidents. The Saturday celebration was organised by a four-person team of event management students at Moray College UHI, who have revealed that preparations are already ongoing to hold it again next year. Organiser Gemma Geddes admitted the team had been “overwhelmed” by the amount of people who had attended. She said: “Moray has never held anything like this before, although there are similar events held in Fraserburgh and Glasgow. “A lot of the emergency services have come to thank us for having them along, but the whole point of the event was to thank them for being ready to respond every day. Visitors inspected the inside of the emergency fleet, which included the RAF, the police and one of the coastguard’s rescue crafts. Head down to Moray’s first Blue Light Festival! Inside, fire crews demonstrated the technology employed to help them fight blazes while representatives from the armed forces also provided information on their own operations. Sitting on a blood bike belonging to North East Rider Volunteers (Nervs), which is aiming to expand into Elgin, proved to be one of the most popular attractions. Volunteer rider Pat Costello explained that opportunities to raise awareness of the group were invaluable. He said: “It has been amazing. I don’t think we expected anything like this amount of interest.